Even without quick-attach features, this blade clamps on and moves snow. Got snow and no quick-attach hook-up on your compact tractor? No problem, with Worksavers' new clamp-on snow blade. The economical blade is perfect for small parking lots, driveways and sidewalks. The attaching frame easily slides over the cutting edge of front-end loader buckets and extends under the bottom of the bucket for complete support. The blades install and dismount easily with a chain and turnbuckle system. The blade features a 3/8" thick, 5' or 6' long cutting edge (depending upon the model) made of 1044 steel. The blades have the ability to angle right or left with simple adjustments. 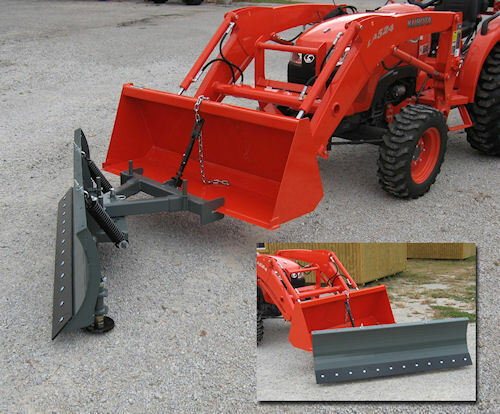 Compact tractors, even without quick-attach hookups, can move snow with Worksaver's new clamp on snow blade. For more information before the snow falls, contact Worksaver at (217) 324-5973, or visit www.worksaver.com and click on "snow blades."